You are here: Home / Jewelry / Art Nouveau gold and Iranian turquoise necklace. 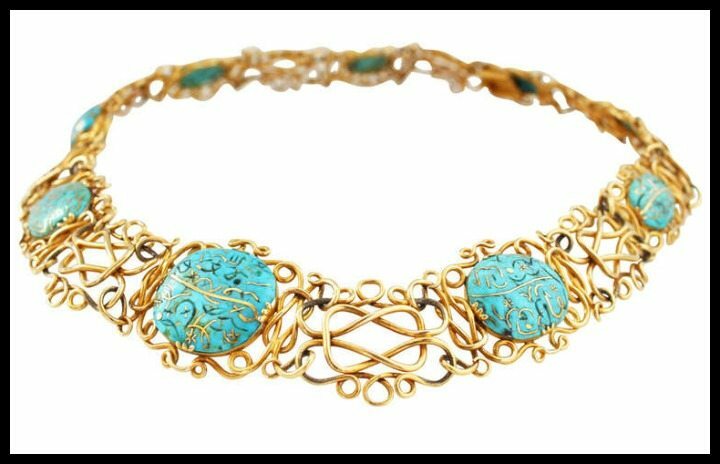 Art Nouveau gold and Iranian turquoise necklace. 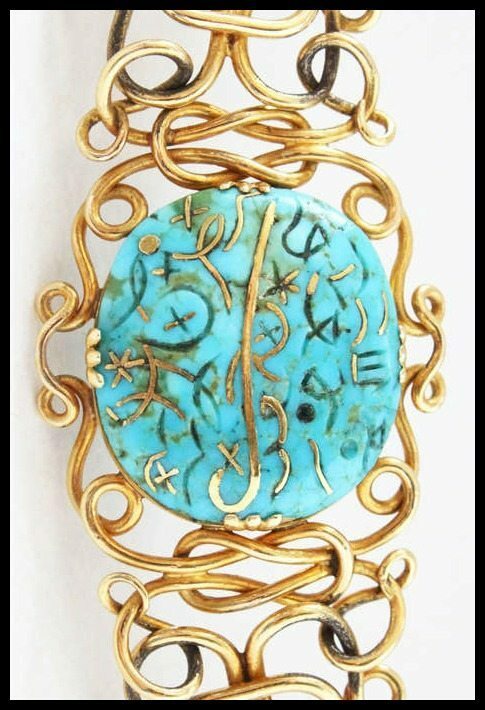 I have something very cool for you today, my dears: a gold wire and rich glorious gold-inlaid Iranian turquoise necklace. This spectacular 14 karat gold wire necklace dates to the Art Nouveau period; it was made in the early 1900s. Which is amazing, considering how elaborate the majority of this piece is. At first glance, I assumed that this would be choker length, but it’s quite a bit longer than that: it’s nearly 20 inches. I wonder how flexible the wire is: if it lays flat, or if it is more firmly fixed in curvature. Isn’t it incredible? Just look at that intricate wire-work. So beautiful and interesting. And, of course, the stones! I said it was an Iranian turquoise necklace, so here is the turquoise. Antique, gold-inlaid turquoise, to be specific. The description says that the gold inlay forms Arabic symbols, but doesn’t give any information about provenance. I assume that the gold-inlaid turquoise predates the necklace? I would absolutely love to know the story behind those symbols. What do you think of this beauty? Would you wear it? And more importantly: does anyone think that might be able to offer some more insight into what the history behind those gold-inlaid turquoise stones could be? I’m desperately curious. 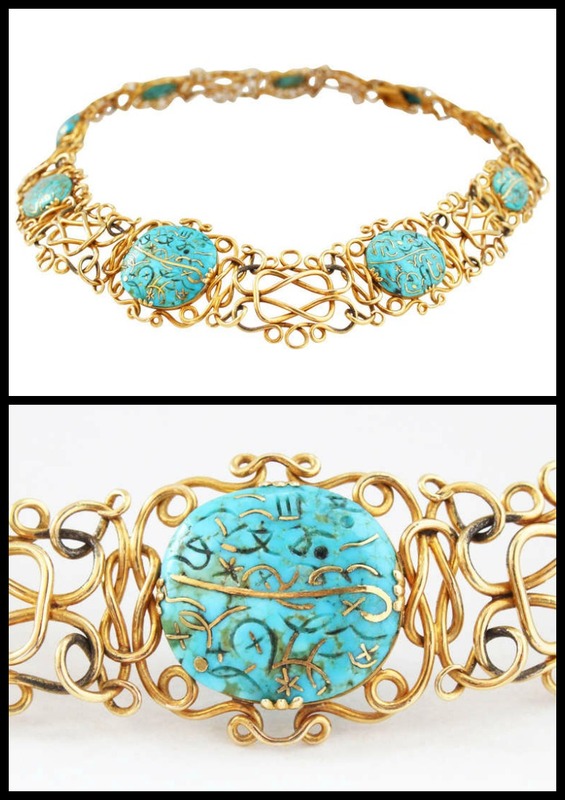 This gold and Iranian turquoise necklace is currently for sale by Global Gems, listing via 1stdibs. All images and info are thanks to Global Gems and 1stdibs. Wow, what an incredible necklace! I want it on me. You could totally rock this. Gorgeous! I would totally wear this!